Hobby Lobby is suing to be exempted from certain provisions of the Affordable Care Act.? The Supreme Court has agreed to hear the case. 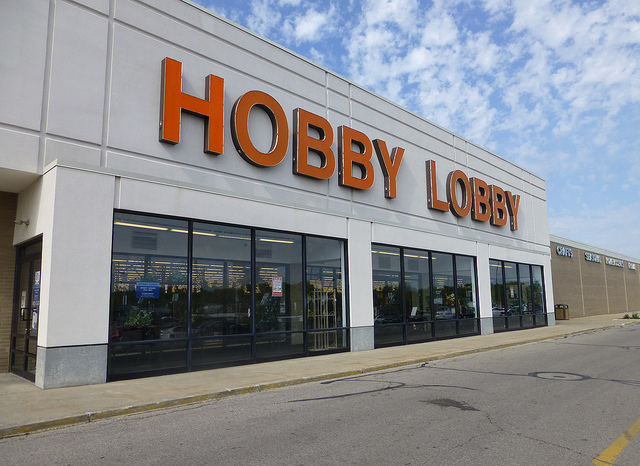 Hobby Lobby is a privately-held company with 500 some stores in 41 states and over 13,000 employees.? The issue here is quite different than with small businesses (50 employees or less), which can opt out and urge their employees to get their own health insurance on the exchanges.? Companies of this size are required to cover their employees, so Hobby Lobby has less wiggle room than much smaller concerns. The question at the heart of this is, should a company be forced to pay for things with which it has a moral objection?? Here’s Hobby Lobby’s argument.? Seems fairly straightforward, and as far as it goes, believe it or not, I have some sympathy.? Wouldn’t it be wonderful if everyone could opt out of paying for things we don’t like?? There are any number of government programs I would like to refuse to fund, most especially tax credits for large companies.? Back when I had cable, I would dearly loved to have opted out of paying for all the sports channels I never watched, but the deal was, it’s a package and, so I was told, everybody gets them, you have the remote, change the channel. We could go down a very long list of things we are all overtly or covertly made to pay for that we’d rather not, some just because we don’t like them, others because we strenuously object.? There are times I would truly enjoy having a more direct input into how my money gets spent. It would seem possible to accomplish something like that in the not-too-distant future, with things like crowdfunding.? A similar protocol might be established for tax-funded programs so people could have a more direct say.? I’d be all for it.? As I say, there are lots of things I pay for in the course of umbrella payments that I don’t like (like, for instance, the NSA). On the other hand, I’m not so arrogant as to believe I have the right to determine what should be available for other people. There are a couple of things about the Hobby Lobby suit that run a bit deeper than the surface complaint.? Okay, they don’t want to pay for birth control coverage for their employees—and to be clear, this is not, apparently, a blanket objection, they have very specific products in mind which would seem to conflict with their religious convictions—and they’re making a moral stand on the issue.? If this is, in fact, such an important thing for them, one wonders why they continue to buy products from China, where state-mandated abortions have been the norm for some time, but maybe this is just being overly-critical.? Business is business, after all, and should not be confused with morality. What they’re threatening to do is close up shop if they lose this case.? Throwing 13,000 people out of work.? This looks for all the world like the Greens are saying to the government “If you make us do this, we’ll hurt 13,000 people to get even.”? Or make a statement.? The Greens will be fine, they’re worth about two billion, and I rather doubt they’ll just close everything down, they’ll sell it. ?? This won’t cost them a thing, materially. Here’s an idea:? trust your employees.? The coverage in question is a tiny part of an overall benefits package.? The company isn’t required to force their employees to make use of it.? Why not just trust the basic moral conviction of the employees that they won’t utilize it? But that’s not the issue.? The issue is the tacit support of practices with which one disagrees. As I said, I have some sympathy for the Greens.? You go along, abiding by the law, doing the necessary things in order to make your way in the world and be part of your community, while maintaining your own identity and values.? Everyone compromises, but you like to think that either you will never have to face a truly unacceptable choice or that you will have the strength of character to refuse to go further.? The only thing that complicates the question in this case is simple: it’s not all about the Greens and Hobby Lobby. Nor has it been since they opened their doors for business.? Because one of the sets of compromises a business makes is that the more successful it becomes the less it is about the founder’s priorities and the more it is about that fuzzy (but very broad) zone where your company becomes part of the larger community. I have heard it argued by people of a more libertarian bent that if they own a company they have the right to say what goes on within it.? That no one has a right to come in and dictate to them how to run things.? Like just about everything else, this sounds plausible in principle but in practice it is wrong because it overlooks that interface.? Once you accept a relationship with a community, that level of determination ends and community priorities encroach.? Which is why you can dictate the color your company will paint its walls but not the standards of the paint you use.? OSHA gets to come in and determine worker safety because it’s not about you but about your employees—or, more simply, because you live in a community and it is their welfare that trumps your claims of owner rights. It really ends the first time you take tax money to operate, in the form of credits or tax increment financing, because that makes the community part owner and definitely a shareholder, even though we tend not to talk about such things that way.? Because you have tacitly accepted a position within that larger community and they get a say. On an even more basic level, a company that is for profit asks the indulgence of the community in which it exists in order to be allowed to make a profit from it.? Just as it’s a matter of customer relations that you the owner have less say in how you do business, you are also inviting members of that community in to help you make that profit.? Sure, you pay them, but it’s a much more complicated relationship than the one you have with the kid who shovels your sidewalk, because the community doesn’t depend in any crippling degree on whether or not you pay that kid, but the well being of the community becomes more and more dependent on your business as it grows and it bases everything from real estate values to street cleaning schedules to school funding on your presence. So the question of an ability to opt out of certain things because you as a business find fault with them is not a question of one single moral principle, but of multiple moral principles, some of which can come into conflict with each other. This is complicated further by the religious component.? Long ago this country determined to exempt religious institutions from certain requirements, even though the rationale was a bit slippery.? We viewed taxing churches as a tax on conscience, and as far as it goes I agree with the exemption.? But like any other large concern, churches are much more than simple places of worship.? Some of them are landlords, property owners, investors, publishers, even bankers.? Their tax exempt status is so much more problematic today than two hundred years ago, but we have maintained our tradition of exempting them from taxes and certain other requirements primarily because we do not wish to have a prolonged and divisive court war over the matter. This is where single-issue politics runs into its own slippery slope of impracticality, because precedent doesn’t act in a vacuum.? The law of unintended consequences spreads like virus in these instances and suddenly you find that what you thought was a simple, one item complaint has blown up into a crippling confusion of attempts by people to isolate themselves from the community in which they live at the expense of everyone else. Hobby Lobby’s owners say they don’t wish to pay for contraception (of certain kinds) for their employees.? It seems to me they’ve made an issue out of something which hasn’t been for them before in any other way.? They aren’t.? They’re paying for medical insurance.? For health care.? Which their employees may use as each chooses.? That this coverage is bundled into the coverage by law takes it pretty much out of their hands.? They can’t even turn around and change their minds and say they want to because they don’t have that say.? What their employees do with the coverage is, at the end of the day, none of their concern, at least insofar as direct responsibility is involved.? That’s why it’s lumped together in a single package.? If you could divide it up like that, it would very quickly become the same problem that brought us to where we needed healthcare reform in the first place. But I repeat, I have sympathy for their view.? As I said, I have a laundry list of things I would dearly love to not fund.? But I recognize why it works the way it does.I would like to know, though, what difference there is between having the government tell us how we should live and letting the owners of corporations tell us.? Just what do you do if they’re both wrong? People should note that the “freedoms” allegedly under “attack” are those of corporations whose owners do not agree with particular policies. Corporations can have “religious rights” when the first, like GM or Ford, is executed for intentionally killing people to save money. Corporations can have “religious rights” when the first one goes to prison for 10-15 years for stealing hundreds of thousands of dollars in wages of its employees’ wages like McDonald’s. Corporations are NOT “people, too, my friend” unless they can be executed or imprisoned like any regular criminals. The Hobby Lobby Folks could have applied to HHS for a waiver and made a cash payment to their employees in lieu of buying a corporate insurance policy. If HL gave employees a tax equalized amount, both would be in the position to follow their consciences. The employee would have the money and could buy insurance with the mandated coverage or simply pocket the money and pay a fine, and follow their personal religious or economic beliefs. The lawsuit was never about “religious freedom” but, another racist rightist attack upon the Obama administration by vitriol filled bigots who hide behind religion to disguise their un-Christian behavior.